There’s a big pot of pasta boiling on the stove, next to it a delicious homemade veggie-extravaganza tomato sauce with a liiiiittle bit of pesto mixed into it. I’m not wearing the dress above, but my pink leopard print pyjamas. Rawr. The September issue of InStyle is lying on the table ready for my trip to Canterbury this Saturday. I did it folks. I’m going. To a different country. All by myself. I made the decision quite last-minute so I only have the Ponds that I had left from our trip to London (a whole £11! – and that while they had Humming Bird bakeries), but was lucky enough K also had some left. With £21 in the pocket and magazine, I’m going to explore a little more of what is possibly my most favorite country in the world: The UK. This is the good life. I’ve planned to visit Blackfriars – of course – and a few other gardens around, a farmers market and see the cathedral. I hope to find a place to have high tea – all by myself – and maaaybe if I’m lucky, I’ll stop by Topshop and Gap. I can hardly wait! If this adventure goes well, there will be no stopping me! I also want to thank Johanna for already mailing me her recommendations. Your email is printed and already stored safely in my backpack! If you’ve been to Canterbury before and have some tips on cute shops, fabulous cafes or restaurants I should visit, please don’t hesitate to share your treasures! I have got one day, and I really do want to make the most of it. Wow these pics! Love them so much. Beautiful. Canterbury is pretty, I spent a day there with family friends who live in Kent. Love the little houses, went into some historical buildings that you have to bend under each doorway (I'm not that tall) it's very fairytale. Because I was with old people we ate soup at M&S and then I snuck away from them to go to the Topshop. wahaha. 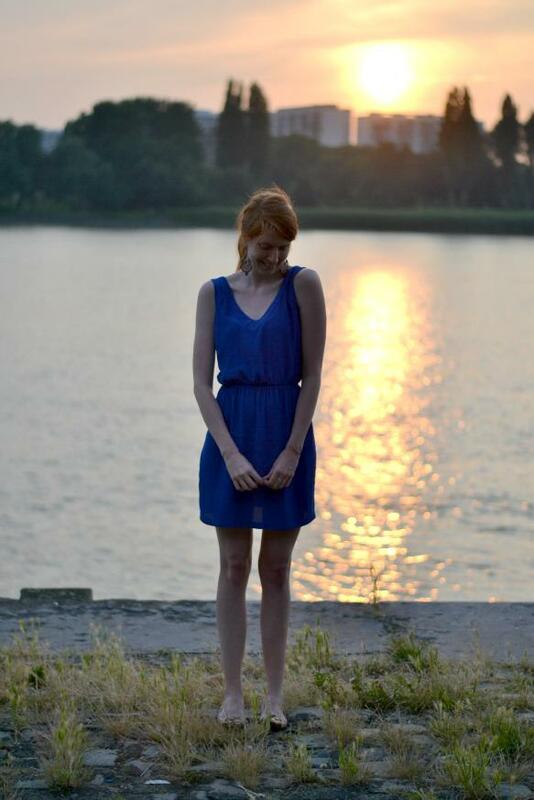 You look great in cobalt. Definitely your colour! Hope you have an amazing time!! Dit jurkje staat je ook echt mooi! I was like "wait, I didn't email anything", and then I remembered I'm probably not the only with that name haha I hope you have so much fun! I'm in love with your dress! Amzing! you are and insanely chic lady and we will hardly wait for your adventures in UK (do post pics)! You're in England right now?! So fun! Have a blast! Also, you are a knockout in that dress. how fun! have a wonderful trip! Oooooh, can't wait to read you story, it will for sure be a marvellous day! this pictures are GORGEOUS! cobalt is your color. have fun on your trip, sounds perfect! Love the dress. And I've been into cobalt blue lately as well. It's such a striking color with my red hair! That dress looks amazing on you! I can see why you love cobalt blue so much! first of all you look gorgeous in this dress. like soo good. second of all um have so much fun! You look gorgeous in this shade of blue! die kleur staat je super goed! The sun's reflection on the water is so beautiful. Have fun on your trip! You look beautiful! That dress and colour suits you so well. Mmmm pasta and pesto. 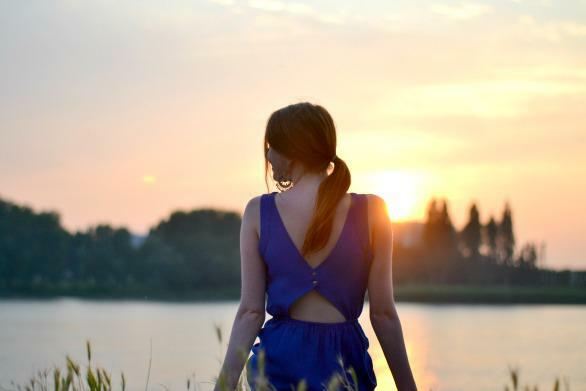 How gorgeous are these photos – that sunset and the royal blue dress just lovely. Heel vet dat je alleen gaat, hopelijk heb je je goed geamuseerd! En is het een begin van meer reiskriebels 😉 Dat blauw staat je trouwens prachtig, en die rug is zo mooi! Absolutely gorgeous. These photos are beautiful! This dress looks amazing on you and the photos are absolutely stunning. Canterbury sounds divine, I'm sure you're gonna have a great time by yourself! And this dress looks gorgeous on you. Beautiful photos, devine dress! You look lovely. That color really fits you perfectly! Mooi kleedje, die kleur staat je echt super leuk! You are quite the stunner in this dress! The sun reflected on the water is such a vision!